Thanks, Brad. I knew it had a western theme, but…..If you or any other readers have memories, photos, other materials you would be willing to share on WTH history, I would be pleased to see them. The Vigo Clay Company was converted into a mushroom factory. My Grandma and Aunt told me stories about working in the mushroom grow house. They also said that people brought eggs there to sell. Grandma, and others, would crack eggs all day into big wooden barrels which were then transported to Terre Haute buisnesses. Glad you mentioned the mushroom plant. I have been trying to gather more information about it. I have a few items. I believe it was begun in 1937. I remember it still being in operations in the 1960s. Thanks for sharing. There were two bars in Toad Hop that I recall. We would get our allowance and spend it there. They stocked candy and soda and we would stand at the door while the bar tender would get our requested items. I mostly remember buying Bubble Up. Yes, I remember BubbleUp and RC cola, my favorite at that time. Thanks for sharing your memories. Do you have any photos showing Toad Hop or West Terre Haute from that time? Thanks for the info! I have only lived here 10 years, came when I married one of the Ream boys. This town has such a history! It was Marie French tavern long before Western Star, and across the road (old U.S.40) was Vi and Noel Lindsey tavern. I moved to Larimer Hill in 1962. Toad Hop was my stomping ground. The most noted person in my book was Jesse Allsup. He was a good old man. An all white town (but then again what part of West T. wasn’t) that was wary of strangers. I swam at the mushroom plant and climbed the stacks There are tunnels all thru the place. As a teen that was a fun place to hang out especially the trussle at sugar creek. Toad Hop is about vacant now due to flooding, but I will always feel like a Toad Hopian. Sure miss those days. Thanks for the info. We moved to Larimer hill in 1960. Do you have any other memories of photos of West T. Or Toad Hop? Would love to hear about them. Being born in West Terre Haute, 1n 1951 I can remember living on 4th and Johnson. On the corner was Valley High School. Paris Ave. was a main drag with Gropps Hardware, Storms Tavern, Calvary Tabernacle Church, Dennis Combs Grocery, Berry Drug Store, Luchens Tavern, First National Bank, WestT Post Office, 2 five and dimes, Blue Bird Café, Young Mens Club, West Terre Haute dump by the Selvia Distributers. Bedino Funeral parking lot was a big hole with huge chunks of concrete then. On U.S. 150 between Johnson and Miller Ave. was a chicken house where you could pick a bird to buy and the guy would cut its head off and pluck it.. Across the street from us was the Harris family Mr. Harris had the old shoe repair, and Mrs. Harris worked the soda fountain at Dodge Drugs on National Ave. Next door was Miss Dumas, the first grade teacher. Hard to believe the memories and I wasn’t in 1st grade yet. How could I forget Ratcliffe Realtors and Rays barber shop where I got my first hair cut. He put a board across the arms of the chair for me to sit on. Had a huge picture of Custers Last Stand on the wall. The owner of Storms tavern was Spud Storms. Miss Dumas was my first grade teacher also. I remember Miss Dumas very well, She would call your name and through what ever she had. I was also a little afraid of her I think it was her voice. I have a form I send to to people who lived in West Terre Haute. If I email it to you would you be willing to fill it out? It asks question about growing up there. send the form. cant guarantee I have answers. Yes, my husband and I can both fill out the form. We both grew up in WTH. I was born and raised in West Terre Haute. Please email me a copy of your form..
1956 to 61 lived on 4th Riggy St. In 56 started 1st grade 1st -3rd at Central. 4th-6th at North. 7th-8th at Concannon. 9th-12th at West Vigo. Starting NE to W. What I remember. Dump, Selvia Distributor, Big Zephers, Dan Smith live bait behind Zephers. Bedino Funeral, Flower Shop, Marathon Station, U.S.150, Hunters Shell Station, Brownies Feed Store, 4th st., Ramsey Tavern, Police/Fire Sta.,alley, Warehouse, VFW Post, 6th.st. American Legion, train car cafe,7th st IGA food, church, 8thst. Garment building, Little Zepher (Red Wallers) 9th st. Phil Glicks Standard Gas Station. Houses spotted all along between these places. Starting SE to W National Ave. Ellis Pond (wet lands now) ?street, Jones&Brooks fabricators, Dog&Suds,? Street, Ernie Forster Texaco, 2nd street, homes 3rd st, Manns Grocery, homes, Junes Ice Cream, Warehouse, 4th st. Ramsey Liquor Store, Bluebird Ice Cream Shop, 5th st, Owens gas station, car lot, 6th st. Pages food store, Produce house, Honda Motorcycle, 7th st.Ace Hardware, coffee shop, Small grocery,8th st Bertha Diner, Lawn mower sales, National motel, 9th st. Wayne Miller DX gas station, Wheel of Fortune, West Inn Truck Stop, Kuykendall popcorn, D&H, junkyard. Homes spotted between some places. May not be accurate but close. Is this what you want? Great. Thanks. Who are some of people you remember most? People of Toad Hop were Niccums. Allsups, Certains, Frenchs, Ellingsworths, Lindseys, Comptons, Heyens, Andersons, Beelers, Powers, Biddles, Fortunes, Millers, Dillinghams, Lascurains, Shueys, Browns, Parsons, Clarks, Fritz, Vines, Pruitts, Longs, Johnsons, Morris, Lemays, Attersons Neices, This was when Marie French had her tavern on the south side of the road where the Supper Club is now. I got married in 1970 and left Larimer Hill. Still with her and have two boys, ten grandkids and five great-grandkids. Youngest of the Browns here. We moved away after my mother died, but I still take a drive through now and then. I am very excited , sorta to read all this and to see my family’s name in the comment above. Was talking to my step sister earlier, Terri Johnson about all we could remember about Toad Hop!! The Dillinghams and Johnsons lol what a rotten group of kids we were! I was a stepsister so Dyer was my last name. I don’t know why Toad Hop was viewed as such a dark place. It was a great little village to live my 19 years. We would play after dark with all the neighborhood kids and had no fear of anything because all the families looked after each other. It was common to find all of us, boys and girls of all ages, taking sides in a hot summer’s day of softball in Miller’s Field. The railroad track was our highway to South Lake or WTH. By the way, the grocery store was called Miss Mack’s. Great memories . . . .
Donna, I would love for you and others to send me more memories of growing up there. By the way, I have already had 200 accesses of the Toad Hop blog today. How did this happen? How did you find out about it? just wondering. Thanks. Donna, I think the view of Toad Hop was one of perceptions by outsiders. It is much the same with the West Terre Haute of today. People hear things, just look on the surface and accept that as how a town is. It is one of the ideas I want to explore when I write the book. My Dad grew Up On That Hill… He Was Born In 1955 If You Would Email Me The Questionnaire I’ll Have Him Fill Some Things Out. Sam I would really like to see that book. One of my Uncles was the Chief of police of West Terre Haute. We lived on Johnson. I seemed like I had lots of family all over. Can you send it to me at kitten1820@msn.com Kathy Davis. Thank you. I would to love to read it please send it. I grew up on the hill. I was born in 1956. Zelma lived right behind me. I would like to fill out your questionnaire. Does anyone recall the shoe repair shop across the street from Ace Hardware? Or Johnson’s Variety store at the corner of N6th and National Avenue? I believe there was a Pages market on the corner of S6th and National. I’m sure everyone remembers Dodge drugs. They were neighbors and recall they gave full sized candy bars to all the trick-or-treaters. It was a right of passage to be old enough to walk to Dodge drugs after church, dime clutched in palm, to buy a coke at the soda fountain. I was about 6 when I saw a semi hit the gas pump at Brown’s feed store. I also had Miss Dumas for first grade. Harris shoe repair. Mr. Harris repaired shoes and his wife worked at Dodge Drugs. I lived across the street from them on Johnson and went to school with their son Terry. Mrs cooley was my great grandma….we used to visit quite often…she broke a hip and moved in with us for awhile….she passed when i was around 13. Cant really remember a mr.
My great grandmother was mrs cooley….love to visit…dont ever recall a mr. She broke a hip and stayed with us awhile in west terre haute..
My mother(Carrie) lived in toad hop with her 3 brothers and 3 sisters. She was the oldest girl. My grandparents are gene weir (rip) ann weir, Harmon, York, uncles rob, frank, and Kevin ( still in toad hop). My aunts are Diane, Marie, and Brenda. Email the form and I will ask them what they remember. Bottom of picture is cut off. Anyone have the original & know who is in the picture? Would appreciate it! – if you are recalling the streets ape of National Avenue, the National Barber Shop (owned by my father, De Grubb) was situated between Dodge Drugs and Pages Market. Loved your dad to pieces….worked at dodges…we visited a lot.. Anyone remember a Toad Hop Bicycle Post? In the 1890’s, that private, non-govermental service would deliver mail via bicycle. I would like to know more about it. If you have any information, mail me at xbobharper1@gmail.com. Thanks. Some of my family lived in this area. My Grandpa Frank Farris lived on Larimer Hill. My Grannies family some lived in Toad Hop. Mode Fortune was my Grannies brother. you may have know some of the family. Zelma Hunter was my great grandmother and her granddaughter (my mother) still lives in the “shop”. I have only heard good things regarding her. The family that locked the kids out during the day was my dad’s side of the family. Cousins actually. She was the step- mother to 5 children. She was not mean to them , just the way it was back then I suppose. Zelma was a great lady. Do you know if your grandmother has any old photos of the area? Hey, Tim im trying this out for the first time. im steve johnston Iva was my grand ma. Ill see if ive got a handle on this! Hey, Steve, you reached buddy. If you are still interested in hearing stories concerning life and times on the rough and tumble streets of West T, shoot me an email and I’ll let you decide if they’re what you’re looking for. I’m pretty certain they are… I have come to understand that my Dad was quite the character. I remember one time, I was really young, maybe 5… Dad had stopped somewhere and bought me a bag of little 3-inch tall, plastic Indians. One was made to sit in a canoe that came with them. I remember playing with these Indians down on the creek while Dad was busy doing his business. 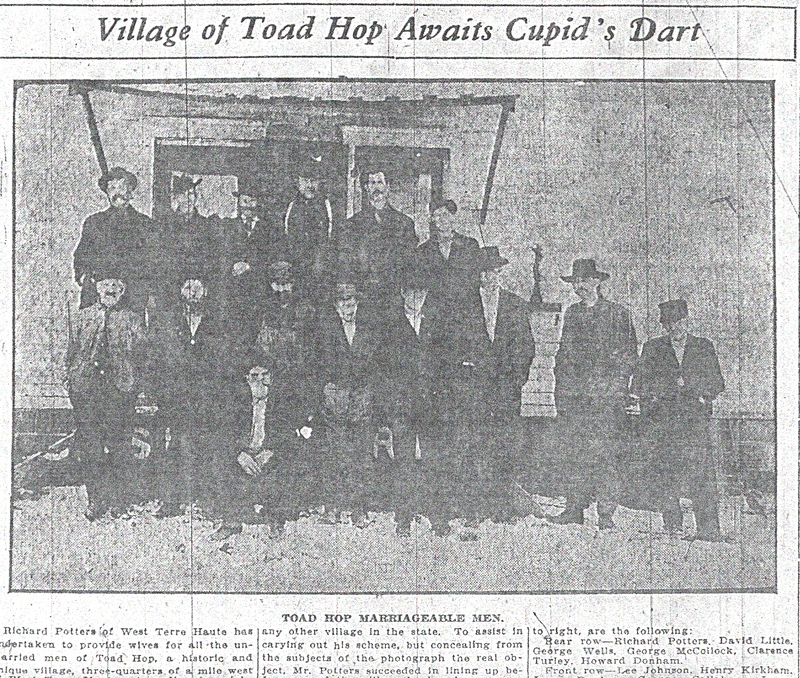 I don’t remember the particulars, but I believe we were back in town after some time away and being a frequent visitor and longtime patron, Dad was catching up with some buddies at one of the taverns in Toad Hop. I’m sure it would have been a Saturday morning because it kind of became a thing with him taking me with him Saturday morning to get our matching flat tops trimmed at the barbershop that just happened to be located next door to the VFW in Tucson where we later lived. I remember losing my Indian and his fine canoe to the currents of Sugar Creek. After about an hour and a half (it could have been longer, I didn’t have my watch), he came down and got me and we went home, probably, I don’t remember much after such a grand day even considering my devastating loss of that wonderful canoe. Have you done the story about the Star Spangled Shutdown of the band at West Vigo’s first notable rock-n-roll concert? When Back in the USSR was nixed?